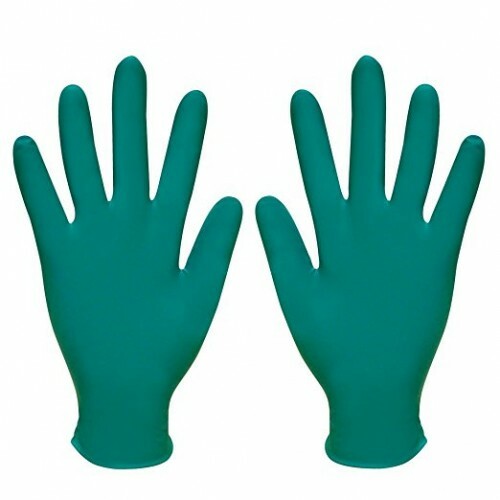 The Finite Green nitrile glove provides a range of features and benefits to the wearer, ensuring protection against a variety of chemicals, oils and acids. STRENGTH - The synthetic rubber offers better puncture and abrasion resistance than natural rubber or vinyl. A rolled cuff provides additional strength and prevents liquid roll back. PROTECTION - This nitrile glove adheres to European Standard EN374, providing a barrier against oils, acids and other chemicals. GRIP - Textured fingertips offer improved grip. COMFORT - The soft elastic material feels cooler and is more comfortable and flexible to wear. LATEX FREE - Ideal for wearers with sensitive skin, there are no latex proteins to eliminate the risk of protein sensitisation. Finite® Green is a nitrile disposable glove which is compliant to European Standard EN374, providing an effective barrier against oils, acids and other chemicals. The nitrile synthetic rubber that is used to manufacture the Finite® Green is extremely soft and flexible providing unparalleled comfort and sensitivity, yet it maintains a tensile strength that is comparable to natural rubber. The cuff is beaded further adding to its strength and preventing liquid roll back. Containing none of the proteins that are present in latex, it eliminates the risk of protein sensitization. The Finite® Green is available in powdered and powder free versions.